The story of Snow White has been mnade into several movies already, the most successful and famous version probably being Disney's Snow White and the Seven Dwarfs. Several quite different movies followed, only the year 2012 already saw three different adaptations: the colorful Mirror Mirror, the trashy Grimm's Snow White and the action-packed Snow White and the Huntsman. The latter, a dark fantasy movie starring Kristen Stewart, Charlize Theron and Chris Hemswort, was most successfull and it is no surprise that a sequel has already been announced. The movie profits from its good cast, the dark atmosphere, the action and of course the nice special effects. This makes more than up for the fact that it has only loose connections to the original story, however, it seems a bit funny that there are now eight dwarfs instead of seven and that the actual fairy tale is not that dark or violent. 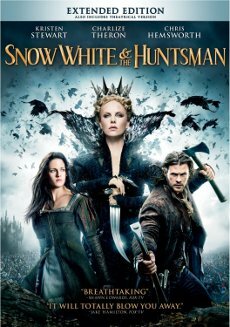 Universal decided to release Snow White and the Huntsman in an Extended Edition featuring more than four minutes of new footage. These extensions are not more than some insignificant plot scenes that should not be seen as more than a nice goodie. They do not make the good movie any better or worse. It is nice seeins these new scenes, although a bit more of Kristen Stewart would probably have been good. This extended version can be found on both the new DVD and BD releases, at least in the US. In the UK and Germany, viewers have to buy the Blu-ray versions in order to be able to see the four new minutes. Comparison between the PG-13 Theatrical Version and the Extended Version, both taken from the DVD by Universal Pictures. The Extended Version contains 5 new scenes and runs 261,6 seconds (~4:22 minutes) longer than the Theatrical Version. Ravenna enters the room and walks through it. Her soldiers are pushing the people around and waste the room. The queen goes to the yard to meet her followers and the prisoner. Warrior: "The remnants, my queen. What do we do with them?" Ravenna looks around: "To the sword." Before she leavess she tells her brother Finn to lock Snow White away. Ravenna: "One never knows when royal blood may be of value." Finn drags her away and the warriors follow their order. The Extended Version lacks a fade over in order to make a softer transition to the next scene. This is the only aspect that can be found exclusively in the Theatrical Version. Finn wants to recruit men for the search of Snow White. Finn: "You men know the dark forest?" Finn: "Load and prepare. You ride for 50 gold pieces." Cut to Snow White and the Huntsman, they are on their way through the dark forest. Snow White: "Does it not trouble you to serve her?" Huntsman: "Who, the queen? I serve no one. Especially that old hag and any other royalty. They're all damned." Snow White: "The king and his true queen are not damned." Huntsman: "The king? He's the one that let the devil in the door. It's his fault the kingdoms plunged into darkness." Snow White: "From you? You know nothing." Huntsman: "What? And you do? What's a wee scrod like you care about the king anyway? You're barely old enough to remember him. The land is diseased. Nature is upturned. This, is the legacy of your precious king." A dead stag can be seen. Finn and the volunteers are riding through the forest. One of the men finds a trace and they start the pursuit. The Huntsman offers William something to drink. William looks at Snow White: "She hasn't changed. She has that same light inside her. You must see it." Huntsman: "You'd be blind if you didn't." William: "Thought about her every day since I lost her. I can hardly believe I found her." Huntsman: "You should tell her how you feel. It'd be good for her." William shakes his head: "No. I wouldn't know how." Huntsman: "Your not telling someone something like that and living with the regret is a lot worse."